Many EVE players think that ship fitting is a game of its own. Well, I agree. Fitting is complex, but also stimulating, nuanced and just so much fun if you're anything like me. And chances are that if you're playing EVE Online, you're at least somewhat like me. Sorry about that. Some fitting challenges are more like "exercises", where you need to find the solution to a problem that we'll give. The solution might be to use good fitting practices... Or totally unorthodox ones. This class normally runs on the EU and AU TZs, roughly every fortnight (that means every two weeks!). I'll try to schedule the EU classes at times/days where the US people can also attend, but that won't always be possible. If you miss a class, don't panic! A new one is likely to be not too far away. If you want to request a class or a specific topic, please do so and I'll try to accommodate! If you like theorycrafting and want to host or co-host this type of class, let me know and I'll be happy to have you as my co-host or help you with your own setup. Also, I'm bad at Photoshop, so if you have a better idea for the class logo, you're more than welcome to help. Last edited by Kyle Hargrove on 2019.04.17 05:40, edited 3 times in total. Next class will be on 2019-03-24 19:30 EVE Time! Small and cozy class tonight! The topic today has been "Fitting for Purpose", and featured a "fix my fit" exercise, the "1M challenge" (fit one ship for a total cost below 1 million) and an exercise on updating the 1M challenge fit to T2. Next class will be on 2019-04-04 08:00 EVE Time! Another cozy class, with good interaction from Twitch today! 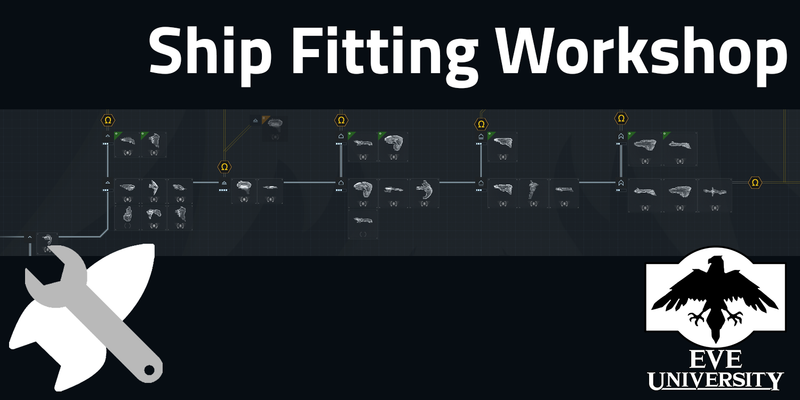 I went over a somewhat complex example of how to fit any ship on the fly with an arty Loki (Auric, your fault) following a basic flowchart that I'll post somewhere here soon. The exercises then were a maximization exercise for a brick Maller, and a "fix my fit" for a Mastodon. Next class will tentatively be on 2019-04-18 19:00 EVE Time! The class might need to be rescheduled because it's so close to Easter holidays, but I'll be sure to post here any updates. Recording of today's class coming soon. Apologies for the late post, but tomorrow's class is cancelled due to IRL commitments (I have a bunch of colleagues visiting me for a meeting these days). The class is rescheduled for 2019-04-27 18:00 EVE Time!